This year we created almost 1,000 new fruit trees by grafting. Grafting is perhaps the most magical means of plant propagation. The basic idea is to use the strong, established roots of a native tree to grow a desirable tree that would not otherwise grow as well. We use the roots of the manzanillo tree. Manzanillos are small fruits that kind of (by a stretch) taste like apples. They grow like crazy here - in the forest, along the roads, etc. Onto manzanillo rootstock we are able to graft pear and quince fruits trees. The method we use is known as cleft grafting, and is also one of the easier forms of grafting. You can read about other forms of grafting on wikipedia. First, find a manzanillo tree. Slice it down the center, vertically, about two inches. 1.Insert two scions, or stems, of either pear or quince tree. You can also try one of each! There are cases where grafted trees contain many different types of fruits: plums, apricots, peaches, etc. It really is magical. 1.Place a grafting medium over the exposed portion of the manzanillo tree. We use a type of wax that we buy from a hardware store, and it seems to work pretty well. For those in Mexico, it is called cera de campeche. For those in other parts of the world, ask around at a nursery or plant store. One of the great things about this type of plant propagation is that after you’re done, the rootstock takes care of the rest of the work. The energy of the once large tree goes straight into those small pieces of quince or pear stems, and without water or work from you, the tree grows heartily. We graft in January and February, which gives the plant plenty of time to recover and start to grow before the rains come in June. 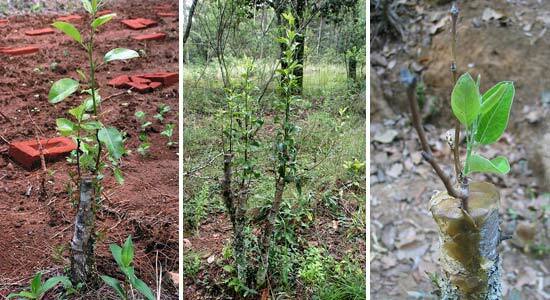 In February of 2008, we grafted about 200 trees with about an 80% success rate. This year, over 900. So, in three years or so, expect to have loads of quince and pears to eat while you visit the Bosque! Nancy is visiting from Australia, and has offered massage to several of our other volunteers and visitors. She is putting our massage table into good use! I used several techniques in my massage treatment to bring greater circulation to the body, in terms of muscles, tendons, ligaments and energy centers throughout the body. Increased circulation, enhanced nutritions to the body so that healings can take place contribute to an elevated sense of well-being for the Mind, Body, Emotion and Spirit. Chinese acupressure: To stimulate energy points in the muscles and tendons throughout the body. Shiatsu techniques: for working along the meridians, which are lines of energy points correlating to the internal organs of the body such as the kidney, liver, etc. Remedial massage techniques: focus on the problem areas of the body. Deep tissue work helps to remove scar tissue and realign fibrous tissues of the muscles and tendons. Swedish massage: with light strokes soothes painful parts of the body by applying firm and even pressure. All of these techniques are applied by the use of thumbs, fingers, palms, knuckles and elbows. Treatment can be through clothes or without clothes with oil on a portable massage table. 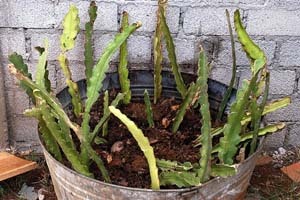 This post will teach you how to make new plants by cutting pieces off the parent plant. That way you can fill up your yard and also make plants to give away. One little cutting from the original plant, treated right, makes a new plant! See those roots coming out of the node? Select your best plants. Each cutting will create an other plant which is genetically identical to the parent plant. So pick ones with the best flowers, or flavor or whatever. Some plants don’t work with cuttings (bulbs for example) or need other methods that I describe here. But this method covers most. Some people are picky about what time of the year to do cuttings, or believe that the cycle of the moon matters… That could be true, but I ignore that and have success. Cut pieces of that plant. Some people get very picky and say you have to use scalpel sharp knives and sterilize everything… I don’t worry that much and have great success. Some plants like you to take the new growth, and others the mature growth. A 45 degree angle seems good. Generally you want a nice clean cut though about 2cm below a “node”. Below a spot where the leaves come out while trying not to rip the plant’s skin off. That node is the spot which the new roots will come out of. Strip off the lower leaves since you will be putting that part in the ground and the leaves would rot. If the stem is long then you can cut the top and make more than one cutting from the same stalk. How you do different kinds of plants will vary, but often a piece about 6 inches long is good. For some plants it can be a good idea to dab a little paint on the top to seal it from drying out. That paint also helps you know which way it up! It may be that cutting the growing end off also makes the plant focus on growing new roots instead of continuing to grow upwards. Dab the bottom in Rooting hormone then tap most of it off. 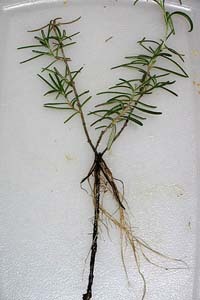 The hormone sends a signal to the plant to make roots. You can get away without using it in some cases. It is sold in a red cylindrical package at home gardening stores and (for locals) at the agricultural supply place on the libramiento in Pátzcuaro. There are other types as well. It is not organic, but well… it works. Women who might be pregnant should not get it on them… actually anybody should avoid skin contact, eye contact or breathing it. If you prefer, you can make a natural rooting hormone from the local willow trees. A web search will help you learn to do that. 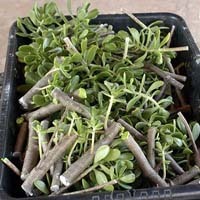 Remove many leaves from the cutting. 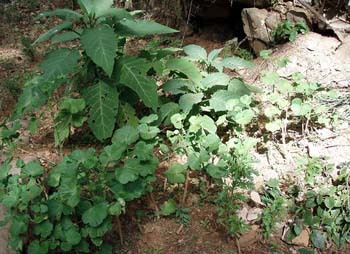 The plant cannot support many leaves since it has no roots. Leave the younger leaves. Put the plant in a safe humid place away from much direct sun. You could put them directly in the ground, or in a pot, or a tray. Some people like to put the cuttings in water which does have the advantage of being able to see the roots showing up! You should use clean water though and you may have to change it often. Some people use peat moss and others care if the dirt is sterile…. I just use healthy dirt which I figure will be fine for the plants. 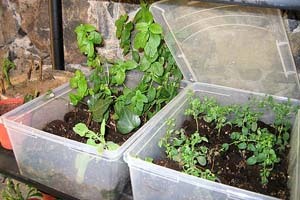 One of the easiest ways to propagate is in plastic trays. They retain the moisture well. Try to let them almost dry out before adding more water though. 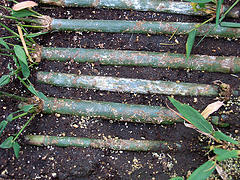 If your cuttings rot, then there was too much water. Now you wait. Check on them occasionally. Each plant is a little different. Mist them if you like, but experiment with doing nothing. Doing nothing is easier. Even if the cuttings look dead, don’t give up on them. After a week or 6 weeks little leaves will sprout. If you get curious you can dig one up and see if there are roots, but you are likely to damage that one. Don’t worry if some die! Some plants are very very easy and others are nearly impossible. I have found geraniums, roses, rosemary, and many others to be very easy. All succulents seem easy. Bougainvilleas seem hard though I am having luck by using larger pieces that I was before. Start with easy plants so you get positive feedback! Try experimenting and you will find much success. This is my favorite way to do cuttings because I want to make tens of thousands of plants and don’t have city water or time to deal with them. At this time of the year in Michoacán you can pick a spot with good shade and dirt and stick your new cuttings directly in the ground! Pick a humid spot. If you do rows of them, then let them grow a year in that spot, and at the beginning of the rainy season next year you can dig the plants up and place them where you want. This is amazing since you never even had to water the plant or use a pot! You can go from one plant to having hundreds in a couple years at no cost and almost no work! My experiment from last year proved It works well, and this year I have about 30 times more garden space devoted to this method. Here is a photo of some datura, geraniums, and a medicinal herb cuttings which are about a year old and I will move to their new homes in June. Here are some videos about plant cuttings: I am thinking I will make my own video sometime. This video shows roots growing. Here is the a fancy way. I consider this overkill. More science that I want. You will notice that people have many different ways of doing cuttings. I have not had good success yet with bamboo. These never did develop roots and I tried a couple other ways too. I will try again. 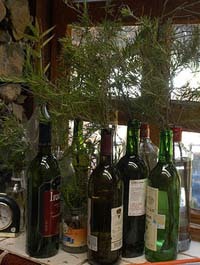 Here are some rosemary pieces in bottles, but generally I prefer to use dirt now. And those are pretty big pieces for rosemary. There is plenty of information on the web if you do a google search for cuttings and plant propagation. If you can’t find help with a question you have by searching on the web, we’d be happy to answer what questions we’re able. You are currently browsing the archives for the lessons category. Entries (RSS) and Comments (RSS). 20 queries. 0.132 seconds.